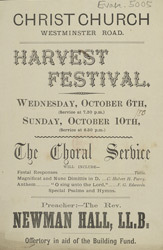 This leaflet is advertising a Harvest Festival service. The tradition of celebrating Harvest Festival in churches began in 1843, when the Reverend Robert Hawker invited parishioners to a special thanksgiving service at his church at Morwenstow in Cornwall. He was aware of the importance of the harvest to his rural congregation; if the harvest failed his parishioners would go hungry, if successful they would have plenty of food for the months ahead. In England & much of Europe, thanks has been given for successful harvests since pagan times. In the USA, it is traditional to celebrate the harvest at 'thanksgiving', which falls on the fourth Thursday in November.